Easter Bank Holiday close dates. Please make-up any missed classes over the next 3 weeks. 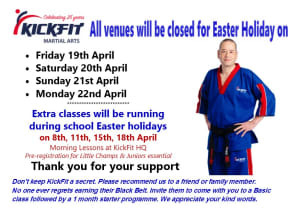 Next week we have extra Junior and Little Champion morning classes at KickFit HQ. Sign-up to take part.